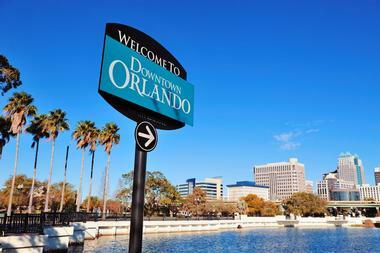 Orlando, Florida is a popular place to visit, especially during the summer months when many schools have breaks. 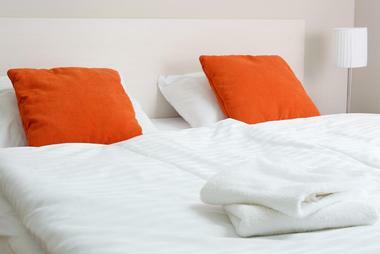 This is the time when hotels raise their room rates, and the weather can be quite hot and humid. 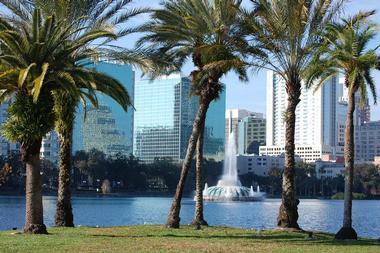 The winter holiday season is also a popular time to visit Orlando - the weather is pleasant, but room rates are high. Early fall is a good time to visit as long as your visit ends before the holiday season begins. The best time to visit Orlando is between the months of January and April. The weather is pleasant and sometimes cool; there are fewer crowds, and room rates are more affordable. January is Orlando’s coldest month with an average high temperature of 71°F (22°C). Visitors can expect an average low temperature of 50°F (10°C). Winter is Orlando comfortably cool and typically only requires a sweater. In February the temperatures rise just a few degrees, retaining the cool weather from the previous month. The average high temperature makes a small increase to 73°F (23°C), while the average low temperature creeps up to 53°F (12°C). Orlando Weather in March: Temperatures make a small leap in March with high temperatures averaging 77°F (25°C). Low temperature averages are just a few degrees short of the 60’s at 57°F (14°C). April starts seeing higher temperatures for the spring months of Orlando. Average high and average low temperatures range between 82°F (28°C) and 62°F (17°C). Despite the rise in temperature, humidity levels still remain low maintaining a comfortable climate. In May, the temperature shoots up to the high 80’s as the short spring season comes to an end. The low temperature is 68°F (20°C) while high temperatures average at 88°F (31°C). Orlando Weather in June: The summer season officially begins in June with temperatures breaching the 90’s by one degree. June also gets the most rain out of the year as the average expected rainfall is 9 inches (222 mm). July is one of the two hottest months of the year with a whopping average high temperature of 92°F (33°C). Average low temperatures sit at 76°F (24°C). In August, both average high and average low temperatures stay exactly the same, tying with July for the hottest month of the year. Humidity is also high during these summer months. Orlando Weather in September: The heat starts to decrease in September bringing slightly cooler days to Orlando. Average high temperatures hit 89°F (32°C) while the average low temperatures peak at 74°F (23°C). October brings even cooler temperatures with the arrival of fall. During this month, Orlando’s high temperature averages at 84°F (29°C). Low temperature is 68°F (20°C). In November, humidity decreases along with the average temperatures. This month receives the least rain in the year with average precipitation rates just a bit over 2 inches (61 mm). Average high and average low temperatures range between 78°F (26°C), 60°F (15°C). December is the second to the coldest month with the average high temperature warmer than January by just one degree. The average low temperature drops to a manageable 54°F (12°C). If you’re looking to make time to visit the Florida Keys, many travelers agree that the best time to go is January through May when the weather is cool and not as humid as usual. November often also has the best deals for vacations at the Florida Keys. October through December is low season at the beaches, except for the holidays of course, while November through April is the best time go hiking and camping in Texas. Trips to the northern beaches and theme parks are better in September when the school season resumes. There are two airports in the Orlando area for visitors who want to arrive by airplane. The Orlando International Airport is close to the city; it is served by more than 50 airlines and almost 40 million passengers arrive here every year. The Orlando Sanford International Airport is located halfway between Orlando and Daytona Beach on the coast. Amtrak runs its Silver Service/Palmetto train from New York, Washington, D.C., Charleston, and Savannah to Orlando. If arriving by car, Interstate 95 runs from Maine to Florida, and Interstate 4 runs from northeast to southwest through Orlando. 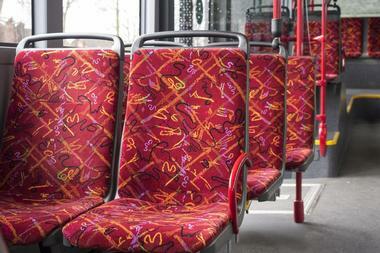 Bus companies that serve Orlando include Greyhound, ATC Buses, Megabus, and Runways Transportation Company. 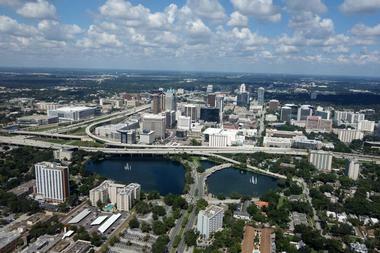 There are several ways to get from the Orlando International Airport into the city. If you want to rent a car, there are many car rental agencies from which to choose. There are several Lynx bus routes that serve the airport: some take visitors to downtown Orlando while others go to Sea World. Shuttle vans are another option: these are shared ride shuttles. Approximately six taxi companies serve this airport. There are fewer ways to get from the Orlando Sanford International Airport to Orlando. There are approximately ten rental car agencies at this airport. Taxis, limousines, and shuttle buses are other ways to get to Orlando from the airport. The best source for visitor information is the Orlando/Orange County Convention and Visitors Bureau on International Drive in Orlando. Staff members at the information center help visitors with questions about where to stay, where to eat, where to shop, but mostly about what to see. The center offers brochures, maps and coupons that are good for discounts or free admission to some attractions: discounted tickets can also be purchased here. There are several sources of information at the Orlando International Airport. There are two Disney offices that help with accommodations and suggestions on how to best spend your time in Orlando. 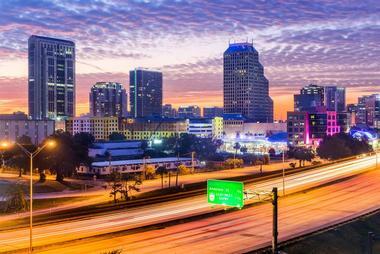 Many visitors to Orlando get around the city and its attractions by car. But if you don’t want to drive a car, there are several other options for sightseeing in Orlando. One of these is called the I-Ride Trolley. This trolley has two routes that cover 14 miles around the theme parks and Orlando Premium Outlets. It offers day tickets and unlimited use tickets. The local bus company, Lynx, is run by the Central Florida Regional Transportation Authority. It is a very affordable way to get around Orlando and its attractions. Many of the hotels in Orlando run shuttles to the theme parks. 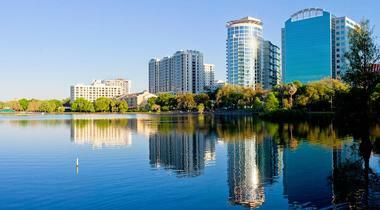 Orlando offers a wide range of restaurants from which visitors can choose. There are fine dining restaurants and, with the arrival of Disney World, many fast food chains came onto the scene. One of the unique ways to eat a meal is at one of the many dinner shows: families and their children will enjoy this combination of entertainment and dining. In addition to the shows, there are also many other kinds of restaurants at the theme parks. 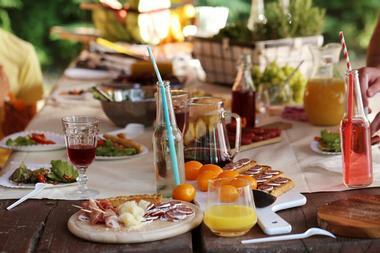 There are restaurants that specialize in gourmet meals and farm-fresh cuisine. Some restaurants are based on themes such as superheroes, race cars, rainforests, and more. When visitors think of Orlando, they think of Disney World. But Orlando is so much more. For example, it is ranked as the fourth top shopping destination in the country. Within the theme parks there are numerous shops that sell not just souvenirs, but other unique items that you will not be able to find anywhere else. 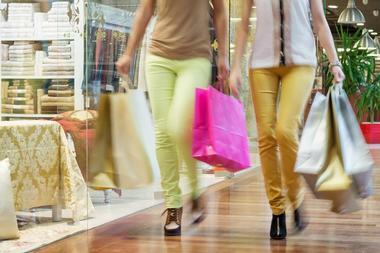 Outside of the theme parks you will discover top-notch shopping malls, quaint boutiques, and outlet centers. Some of the best shopping areas are Downtown Disney and City Walk. If you are looking for one-of-a-kind boutiques, head over to Winter Park: Park Avenue is home to many charming boutique shops. Orlando is more than just Disney World, although Disney World is one of Orlando’s neighborhoods. It is located southwest of Orlando in Lake Buena Vista and is made up of 47 square miles and four theme parks. Lake Buena Vista is home to many resorts, restaurants, and shops. Celebration is a picturesque little area with pretty homes surrounded by white picket fences. Its Market Street has a small hotel and many restaurants and shops. Kissimmee is a neighborhood that is known for its family-friendly budget hotels, restaurants, and a few attractions. 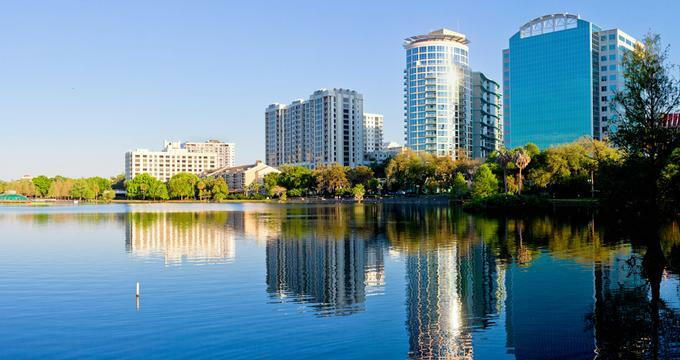 Downtown Orlando is small compared to other U.S. cities, but it has its own charm with a cultural center, clubs, hotels, restaurants, and many antique shops and boutiques. 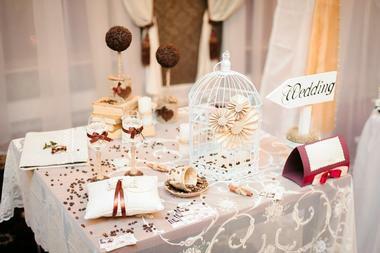 Orlando has many wedding venues, but the first place that might come to mind is Disney World. There is a nondenominational chapel that looks like a Victorian summerhouse; Disney offers a variety of wedding packages and other locations on the property. Outside of the world famous theme park there are hotel wedding venues such as the Hyatt Regency Orlando, the Wyndham Orlando Resort International Drive, and the Radisson Orlando International Drive. Some restaurants host weddings along with receptions: these include chef Emeril Lagasse’s Emeril’s Orlando and the Relax Grill at Lake Eola. Other venues include the Orlando Shakespeare Theatre, the Harry P. Leu Gardens, Grande Lakes, and more. Many visitors go to Orlando solely to visit Disney World. This theme park as well as some of the other theme parks offer a wide range of accommodations. In Orlando you can splurge on a room or suite in a luxury property with lavish amenities; or spend less money on any number of the family-friendly budget accommodations like the Sheraton Vistana Resort or the more upscale Sheraton Vistana Villages. Amazingly there are approximately 400 hotels and 119,000 hotel rooms in Orlando! Vacation rental choices include condos, houses, and villas. There are also campgrounds and RV Parks in Orlando as well as golf resorts.